The Wednesday, February 28, 2018 Climate Justice Forum radio program, produced by regional, climate activist collective Wild Idaho Rising Tide (WIRT), features news and reflections on the recently released, railroad application to build a second, Lake Pend Oreille bridge, endangered, lake, bull trout recovery plans, a Newport, silicon smelter resisters march, early, Port of Vancouver termination of the Tesoro-Savage oil terminal lease, Anacortes refinery expansion opposition, a Canadian navy ship fuel spill in the Strait of Georgia, and other topics. Broadcast for six years on progressive, volunteer, community station KRFP Radio Free Moscow, every Wednesday between 1:30 and 3 pm Pacific time, on-air at 90.3 FM and online, the show describes continent-wide, community resistance to fossil fuel projects, thanks to the generous, anonymous listener who adopted program host Helen Yost as her KRFP DJ. The Wednesday, February 21, 2018 Climate Justice Forum radio program, produced by regional, climate activist collective Wild Idaho Rising Tide (WIRT), features a recording of an Idaho Conservation League, railroad issues meeting in Sandpoint, and news and reflections on an application to build a second, Lake Pend Oreille, rail bridge, Alta Mesa gas well drilling next to the Payette River, a WIRT and Newport silicon smelter resisters meeting and march, an Oregon meeting disruption by Jordan Cove LNG project protesters, and a Trump administration tariff on imported solar panels. Broadcast for six years on progressive, volunteer, community station KRFP Radio Free Moscow, every Wednesday between 1:30 and 3 pm Pacific time, on-air at 90.3 FM and online, the show describes continent-wide, community resistance to fossil fuel projects, thanks to the generous, anonymous listener who adopted program host Helen Yost as her KRFP DJ. At the Idaho Conservation League (ICL) After Hours convergence in Sandpoint on February 13, ICL conservation associate Matt Nykiel revealed that Burlington Northern Santa Fe (BNSF) Railway has applied to the U.S. Army Corps of Engineers, for an individual (not a more lenient, general) permit to construct a second, parallel, 4800-foot, rail bridge over Lake Pend Oreille in north Idaho . The public comment period on this federal, BNSF application could open any day and last 30 to 90 days. BNSF must also first receive a permit from the notoriously oil and gas industry-friendly Idaho Department of Lands, before the Army Corps can approve the project. North Idaho activists and residents are calling on the Northwest community to halt this expansion of the longest water crossing and most bottlenecked section of the Northwest, coal and oil pipeline-on-wheels. In the wake of four significant, northern Idaho and western Montana, train derailments during 2017, and Washington Governor Jay Inslee’s January 29 rejection of the proposed, Tesoro Savage, oil train terminal at the Port of Vancouver, on the day after WIRT hosted the Idaho to Inslee: No Vancouver Oil Terminal! rally in Sandpoint, and BNSF ran four oil trains through north Idaho in eight hours, Wild Idaho Rising Tide (WIRT) continues to monitor and document full, westbound, coal and oil unit trains through the downtown Sandpoint frontline, the present, single-track, lake bridge, and the second bridge, pile load-testing site at Dog Beach Park, southeast of Sandpoint. Please join the regional, climate activist community and #No2ndBridge group members at 7 pm on Wednesday, February 21, at the Gardenia Center, 400 Church Street in Sandpoint, for ongoing discussions and actions opposing Northwest, fossil fuel megaloads, trains, terminals, derailments, rail and lake bridge double-tracking, drilling, and waste injection wells, HiTestSand’s silicon smelter proposed for Newport, Washington, and exploratory, silicon drilling near Lakeview, Idaho. For WIRT’s third-Wednesday monthly, Sandpoint gathering, we have reserved a larger venue than the usual, Eichardt’s Pub, upstairs room, to foster interest and participation in these issues and to host organizers of several groups of Old Town, Idaho, and Newport residents, including Citizens Against the Newport Silicon Smelter (CANSS), presenting an information session about smelter resistance, and linking our various, overlapping campaigns. Invite your friends and families for an evening of conversations sharing knowledge, exploring connections, and creating strategies and tactics in support and solidarity with the movement against extreme fossil fuels and for clean energy and livable communities. Welcoming your ideas and input, we offer potluck food and beverages and current, issue updates and background at this meeting. See the January and February, Sandpoint meeting alerts for other possible topics of discussion (dirty energy protesting, monitoring, and reporting and direct action training, mobilizing, and fundraising), and contact WIRT via email or phone, with your questions and suggestions [2, 3]. CANSS and allies are coordinating and co-hosting a peaceful, public protest of HiTestSand’s proposed, Newport, silicon smelter . Staging at Stratton Elementary School, 1201 West Fifth Street in Newport, at 10 am on Saturday, February 24, they welcome the participation of fellow citizens, WIRT activists, and the regional media, in the march that will proceed on U.S. Highway 2 sidewalks into Newport, down Washington Avenue to Union Street, and back to Highway 2. Wear comfortable shoes and warm clothing, bring anti-smelter signs, and demonstrate your smelter resistance for city, county, state, and company officials. See the accompanying link to the CANSS March through Newport event announcement on facebook, and/or attend the February 21, WIRT meeting, where smelter objectors provide further information and material describing this event . Among a convergence of members, food, and beverages, Idaho Conservation League (ICL) conservation associate Matt Nykiel will offer current updates, background, and informal discussion about Washington Governor Inslee’s recent denial of the Tesoro Savage oil train terminal at the Port of Vancouver, significant, northern Idaho, and western Montana, train derailments during 2017, and ICL work in opposition to construction of the second, parallel, Lake Pend Oreille, rail bridge proposed by Burlington Northern Santa Fe (BNSF) Railway . 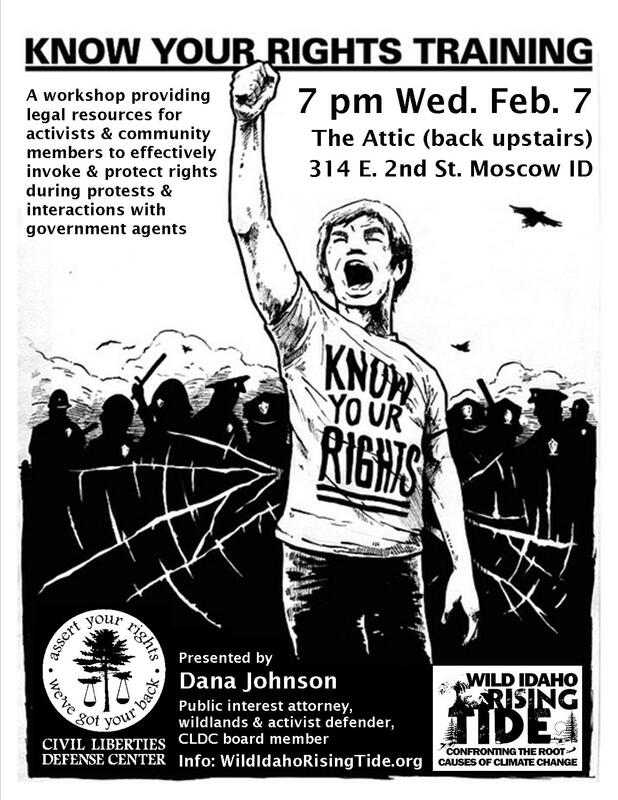 Wild Idaho Rising Tide (WIRT) encourages regional, frontline activists and especially members of the #No2ndBridge group formed in spring 2017 to participate and share their knowledge and actions on these issues, from 6 to 7 pm on Tuesday, February 13, at Eichardt’s Pub, 212 Cedar Street in Sandpoint.